Itaewon is a frenetic place and the most cosmopolitan neighbourhood of Seoul, near to the US military base. With many foreigners living in the area and also heading here in their free time, it’s a place where you can find everything from upscale bistros to late-night Turkish kebab shops. Originally infamous as the place where American soldiers let off steam, the area has cleaned up its act in the past decade and become the hub of craft beer drinking in the city. As well as a variety of beer bars, you’ll also find hip-hop clubs and gay pubs during the night, and independent stores along the Itaewon Antique Furniture Street in the daytime. Not far from the hustle and bustle of Itaewon is the noticeably more chilled Kyoungridan neighbourhood, the birthplace of Magpie Brewing. Meeting us for the first time is one of the founders, Erik Moynihan. We pull up a stool at Magpie’s Kyoungridan taproom, while he pours us a glass of the brewery’s highly popular pale ale, before explaining how the neighbourhood has evolved since it opened. With Namsan Chemisty and PongDang in the area and The Booth, ‘The Bottle Shop’ next door, as well as the White Rabbit tap house on the same lane, it has earned the name ‘craft beer alley’ among locals. Founded back in 2011 by Erik, Tiffany Needham and Jason Lindley, Magpie started out by contract brewing with a large local brewery, and swiftly became one of the early pioneers of the emerging South Korean craft beer scene. Erik explains that “the magpie is a symbol of good news” in Korea and he sees it as the brewery’s mission to help spread great beer culture in the country. 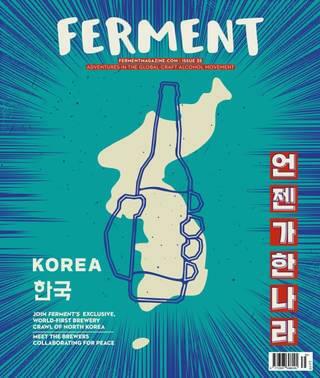 In the early days, it benefited from the reliable custom of the area’s many foreigners, while interest in craft beer was still emerging among Koreans. However, its industrial-chic space, which also serves pizza and hosts classes, small concerts and workshops, didn’t take long to gain a strong following among Koreans. 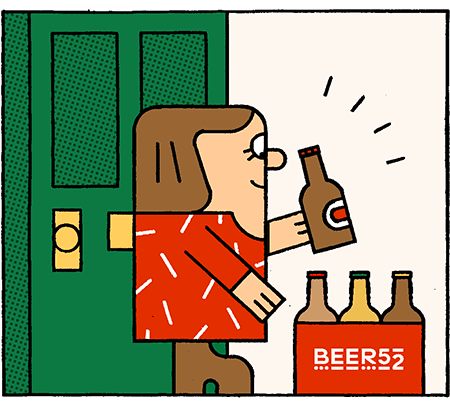 Its branded posters have become collector’s items, adorning apartment walls around Seoul and, now, the Beer52 office. Having expanded into the basement bar below its original premises, the team set its sights on building its own brewery to further cement its reputation for quality and to allow more experimentation with interesting flavours. Jeju island off the south coast, sometimes referred to as the ‘Hawaii of Korea’, seemed like the perfect location. In 2016, Magpie commenced brewing there and has since expanded the team to include head brewer Ethan Katz, who developed his talent for brewing in his native Washington DC, most recently at Ocelot. A popular tourist destination, the island is littered with art galleries, museums and is also home to South Korea’s highest peak, Mount Hallasan. You may also come across female free-divers, known as haenyeo, who hold their breath for up to two minutes at depths of up to twenty meters. The women, some of whom are as old as 80, collect oysters, abalone and seaweed. Magpie makes a point of using local ingredients in its beers, including locally grown peppercorns, raspberries, magnolia buds, smoked Korean hobak pumpkins and tangerines, which the island is particularly famous for. Being based in a former tangerine warehouse, this seemed like an especially appropriate ingredient for the Kolsch featured in this month’s case. All this success is in part thanks to strong support from the community in the brewery’s home village. When it first opened, the Magpie team made sure to throw a big party for the residents and help introduce them to craft beer. Unsure of whether they’d want to drink IPAs, they also ordered in soju, makgeolli and Korean snacks. They were heartened when their guests exclaimed, “no! We want pizza and beer”. Since then, the brewery has tested out all kinds of seasonal releases, one-offs and limited editions at its brewery taproom, including a Berliner weisse brewed with Omija berries. Having collaborated on beers with the likes of Korea’s OCN TV channel and with plans to open more locations, Magpie continues to lead the way as it shares the “good news” of craft beer with the nation.